I believe I mentioned before that I fell in love with Ms Dee’s writing after reading The Countess Takes a Lover. My infatuation has only grown after reading Empath a few weeks ago and the short novel The Countess Lends a Hand just now. I confess that I don’t know how much of the historical detail in the Countess’ stories* is accurate or not—I sense that some of the language may not be, at any rate—but the story telling and the characterization in each of Ms Dee’s stories that I’ve read so far has grabbed my interest from first to last page. From the publisher, the usual warning: This title contains a Regency hero and heroine doing the library lambada, and graphic language Jane Austen wishes her editor would have let her characters use. The man of her dreams is a nobleman. What’s a poor ladies’ maid to do? Reinvent herself, of course. La Comtesse de Chevalier is back! This time Meredith, the heroine of The Countess Takes a Lover, helps her maid, Cecile Lambeaux pass as a gentlewoman in order to gain the attention of Sir Nathaniel Covington. For the first time in her life, reserved Cecile has fallen madly in love… with a man she’s only seen from a distance. She’s willing to have even a brief affair with Sir Nathaniel, whose haunted face touches her heart across the social chasm separating them. Many burdens and secrets weigh down Nathaniel’s lonely soul. He goes to the countess’s house party to take a break from his troubles and finds a woman who stirs him deeply. As Cecile and Nathaniel’s connection grows stronger, Cecile’s lie hangs over her head. Meanwhile, Meredith and Chris work through their own relationship issues regarding trust. Will both women learn their lesson about keeping secrets before they ruin their chance at love? Cecile was first introduced in The Countess Takes a Lover, as Meredith’s extremely efficient and sensible lady’s maid. In fact, as I mentioned in my review, there’s a wonderful scene there between the two in which Cecile’s silence says more than Meredith’s words. From that moment I wanted to know more about Cecile, and I’m very glad Ms Dee wrote her story. Now that Mme La Contesse is so happy with her Christopher, Cecile is more aware than ever before of the emptiness of her own life, and of how unlikely that is to ever change. A number of serving women at the time found love and were married, but given Cecile’s own effacing personality and position in Madame’s household, she’s positive that is not her fate. Then, she sees Sir Nathaniel Covington from afar and grows infatuated with the man she perceives hides behind the title. Asking Meredith de Chevalier for advice or, even worse, help in the matter results in a madcap masquerade during which Cecile receives both a make over and a shiny new identity. She is now Mme. Lambeaux, bosom friend of the Countess, and in a perfect position to catch the eye of any man—knighted or not. For his part, Nate is indeed dealing with emotional conflict and a feeling of hopelessness. Both his past and his present, revealed both through his internal musings and his exchanges with Cecile, weigh heavily on his shoulders. A second son who earned a knighthood through his army service, he is also that stands between his brother’s profligate ways and the tenants, servants and farmers of the Covington estate. I love that Cecile has a valid reason for acceding to Meredith’s scheme; as a maid servant, meeting Nathaniel would have simply never happened, there would have been absolutely no reason for it. Yes, she risked not only her heart but his over the lie, but it was either lie or have not even the ghost of a chance with him. And beyond her true position in the Countess household, Cecile doesn’t lie willingly. Often she’ll sidestep Nate’s more direct questions or flat out tell him she doesn’t care to talk about her past; better to be perceived as short or rude than to compound her sins by elaborating on the deception. She is never comfortable with it, and so is truthful with Nate about her feelings and thoughts about everything. I like Nate very well too; he’s a good man, and perhaps his sensibilities regarding land ownership and the like are too ahead of his time, but he is not one-dimensionally heroic. When we meet him, he is struggling with his sense of honor, his sense of responsibility, his past. His present circumstances are very much the result of his past actions and feelings, but also of things beyond his control, such as family dynamics set in place from his birth. As for Meredith and Christopher, I loved their subplot—even if it may be rather baffling for anyone who hasn’t read The Countess Takes a Lover before this one. More than a year has passed since they first became lovers and, while they are both sure of their mutual love, there are still emotional obstacles to overcome. Meredith in particular is afraid of the future. What if she can’t give Christopher children? Would he ever grow to regret marrying a woman older than him, a woman unable to give him heirs? While there are a few other secondary characters, most of them serve a purpose in moving the plot forward, with two notable exceptions: Nate’s brother Ronald, Earl of Covington, and Peter Cuthbert, young orphan. The former could have oh so easily slid into cookie cutter villain territory… and then Ms Dee gives us both insight into his feelings and a shadow of decency to balance his debauchery. As for Peter… well, you’ll have to read more to see why I like him so. The Countess Lends a Hand gets 8 out of 10. 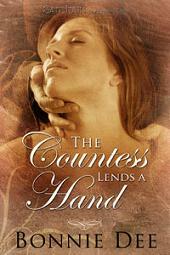 The Countess Lends a Hand is an electronic book available at Samhain Publishing. Thanks for the review. I hope readers of the first book will enjoy the sequel and those who haven’t read The Countess Takes a Lover won’t let that stop them from picking up this story. It’s not like they’ll be lost, although it would of course be better to know Meredith and Chris’s story.